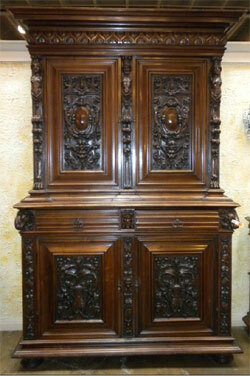 Richly carved circa-1880s French walnut buffet. Don Presley Auctions image. SANTA ANA, Calif. – Over the weekend of Feb. 5-6 – Super Bowl weekend – auctioneer Don Presley will preside over the sale of the remaining inventory of Steven-Thomas Antiques and Interiors, which is closing its doors. Founded in 1979 by brothers-in-law Steven Shedd and Thomas Silk, the prestigious Orange County antiques and restoration firm has operated from the same Santa Ana venue since 1979, redesigning and repurposing antiques for functional use in today’s homes. “Some of the finest oceanfront residences in southern California have benefited from the imaginative design concepts of Steven-Thomas,” said Presley. “The company is very well known here in Orange County, and they’ve sold $150 million in antique furniture since opening their doors.” Steven-Thomas also catered to a large celebrity clientele that included the late John Wayne, who resided in Newport Beach. Their custom work is also on view in the Dorothy Chandler House in the stylish Los Angeles neighborhood of Hancock Park, where they were commissioned to install antique kitchen buffets. French Gothic hall tree, oak, one of several pieces of 19th-century Gothic furniture to be auctioned. Don Presley Auctions image. In 1980, the Shedd and Silk families purchased land on the 55 Freeway five minutes from the John Wayne Airport, and designed and built the Steven-Thomas showroom. It did not take long for Steven Shedd and Thomas Silk to ascertain exactly what their clients wanted. After 30 years of building the business into a landmark antiques and interiors retail destination, the partners are now ready for retirement. Recently, the Steven-Thomas building was sold to a computer assembly company, and the premises must be vacated by Feb. 28. 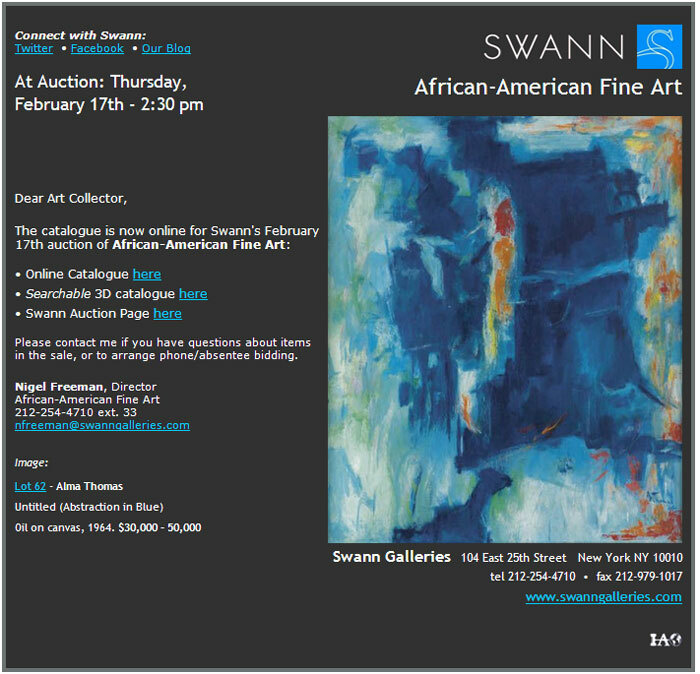 The Feb. 5-6 auction will dissolve the remaining Steven-Thomas inventory in its entirely, with no minimum bids and no reserves. Every article will be sold to the highest bidder, regardless of price. The vast array of furniture includes complete bedroom suites, buffets, hall trees, dressers and chests, Louis XV and XVI mirrors, china cabinets, and dining tables with complete sets of 6, 8 and 10 chairs. Additionally, there are bookcases, desks, Renaissance-style trestle tables and kitchen cupboards. Coffee tables with carved figures at the base, glass tops and hand-carved finials are prime examples of the Steven-Thomas method of recrafting antiques into unique “fantasy” pieces. “It’s possible that someday those pieces we’ve recrafted with have value as unique articles,” Shedd said. 18th-century Russian bronze chandelier with enameled and star-decorated globe; rock crystal and bead adornments on the 12 arms. Don Presley Auctions image. 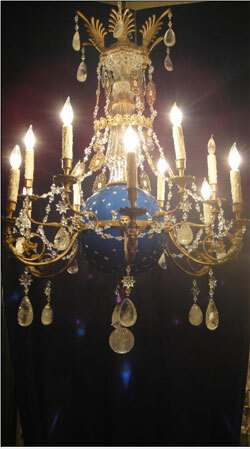 Befitting the palatial furniture on offer, Presley will auction several lavish crystal chandeliers. Among the top lots is a French robust-center chandelier with six patinated cherubs, each holding two lights; and an 18th-century Russian enameled-bronze chandelier with a blue star-emblazoned globe, and crystal and beads surrounding the 12 arms. A very special pair of Lalique chandeliers renders the illusion of a crystal waterfall. Its round, bronze body is decorated with cherub figures on Lalique glass. 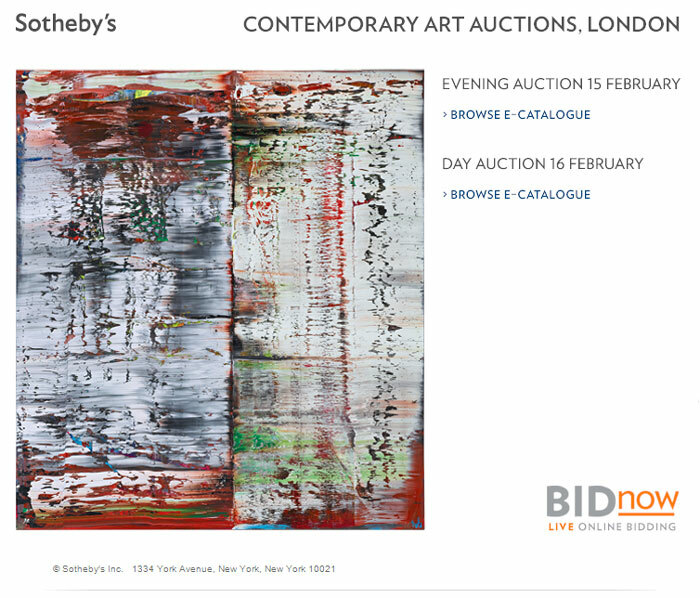 All forms of bidding will be available, including live via the Internet through LiveAuctioneers.com. Note: all purchased goods must be removed from the premises no later than Feb. 15 to make way for the new tenants. Steven-Thomas Antiques is located at 800 East Dyer Road at the 55 Freeway in Santa Ana, CA 92705. 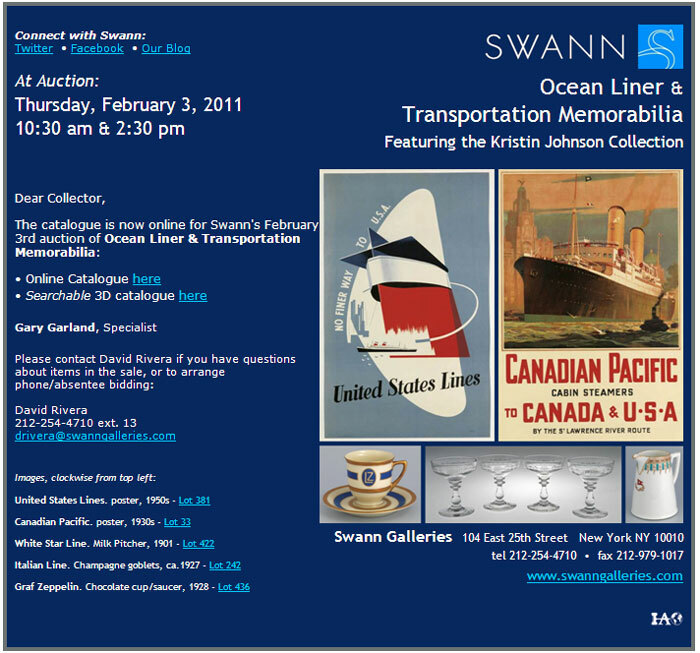 The auction will commence at 12 noon Pacific Time on both Saturday, Feb. 5 and Sunday, Feb. 6. Preview goods any day prior to the auction from 10 a.m. to 5 p.m., and from 10 a.m. to noon on actual auction days. For additional information, call 714-957-3989 or 714-633-2437. 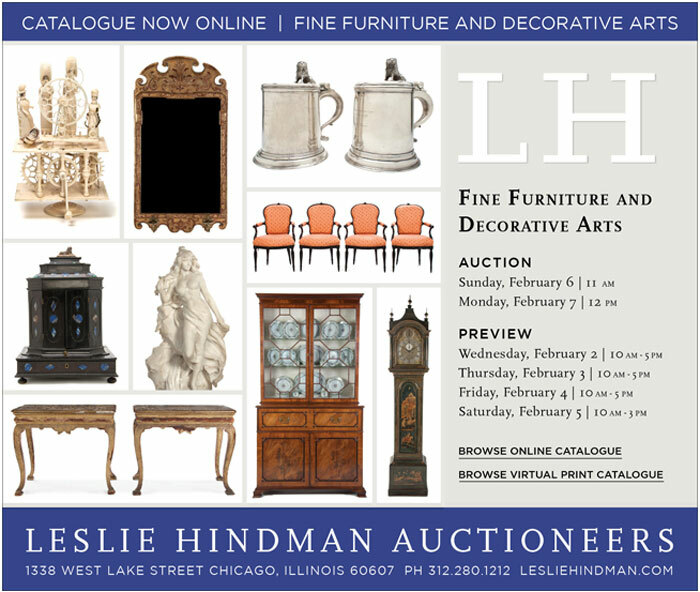 View the fully illustrated catalog and sign up to bid absentee or live via the Internet as the sale is taking place at www.LiveAuctioneers.com. Visit Don Presley online at www.donpresleyauction.com. MARBURGER FARM ANTIQUE SHOW MARCH 29 – APRIL 2 IN ROUND TOP: Going to the Dogs! 1.24.11 Round Top, Texas – The Marburger Farm Antique Show is going to the dogs—- and the designers and the dads and the moms and the kids— and to anyone up for a fun way to feather their nest. The spring show in central Texas opens Tuesday March 29 and runs through Saturday April 2. “When a show is dog-friendly,” says exhibitor Rebecca Looten of Monsoon Imports, “you know it’s also shopper-friendly.” Her yellow lab Marley will greet shoppers from one of the dog beds that Looten creates from antique altars. Buying in Rajasthstan, India for nearly a decade, Looten offers wooden and stone artifacts such as carved deities, rain cisterns, architectural fragments and marble serving platters. Looten plans to fill platters with refreshments during Marburger Farm’s benefit evening for Texas Children’s Hospital on Tuesday March 29. With over 350 dealers on 43 acres, Marburger Farm consists of a not-so-small world of its own. Ten super-size tents and 12 historic buildings spill over with antiques from French to Fifties. But bluebonnets and bloggers aside, the main attraction is the stuff. What’s coming? Ender Tasci of Elephant Walk Antiques in Orlando will arrive with a collection of 17th – 18th c. trunks from Spain, plus a pair of large 18th c. gilded fragments from Italy. “The minute I leave Texas, I start missing Texas,” says Tasci. “For six months, I am living and breathing Texas to get ready for the next Marburger.” Being ready this time includes transporting to Marburger Farm all the fixtures from an old wine shop in the south of France, including wood work counters for use as buffets and nine feet tall wine storage cabinets for use as cupboards and armoires. Don Orwig of Corunna, IN agrees. “Spring at Marburger Farm is our top show of the year. We plan on doing a lot of business,” says Orwig, who will unload a box truck of industrial antiques, store counters and advertising signs. He’ll have factory pieces re-furbished for homes, such as work tables to be used as dining tables and bookshelves made from factory flooring with metal sides from old iron bridges. Also arriving with Orwig will be a set of 70 matching bistro chairs that he bought from a restaurant in Paris. Single-minded shopping, months of preparation and many miles characterize over 350 Marburger Farm exhibitors who will alight near a herd of longhorns with everything from investment antiques from Sweden to mid-century modern antiques for new collectors. In the mix will be creative and mind-boggling displays in each booth, making for room settings of visual wonder. So come for surprises, for the sunshine and for the stuff. The Marburger Farm Antique Show opens for Early Buying with $25 admission on Tuesday March 29 from 10 am through 2 pm, when regular $10 admission begins. Tuesday evening, extended shopping hours until 7 pm will directly benefit the Texas Children’s Hospital with a portion of the entire show’s proceeds benefitting Texas Children’s Hospital. Admission is good all week, with the show running on Wednesday, Thursday and Friday from 9 am to 5 pm and on Saturday, April 2, from 9 am to 4 pm. Admission is free for children 15 and under and dogs on a leash are always welcome. See information on vendors, travel, maps, lodging, shipping and special events at roundtop-marburger.com or call Rick McConn at 800-999-2148 or Ashley Ferguson at 800-947-5799. Posted in Auction News | Comments Off on MARBURGER FARM ANTIQUE SHOW MARCH 29 – APRIL 2 IN ROUND TOP: Going to the Dogs! 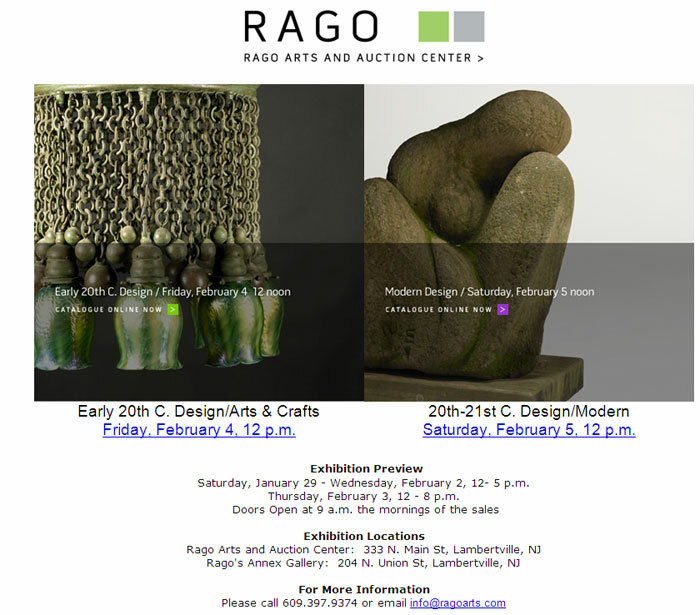 The sale will include a broad spectrum of art and antiques including European and American decorative arts and furniture, fine jewelry, fine art, Chinese artifacts, Americana and bronzes, amongst other categories. 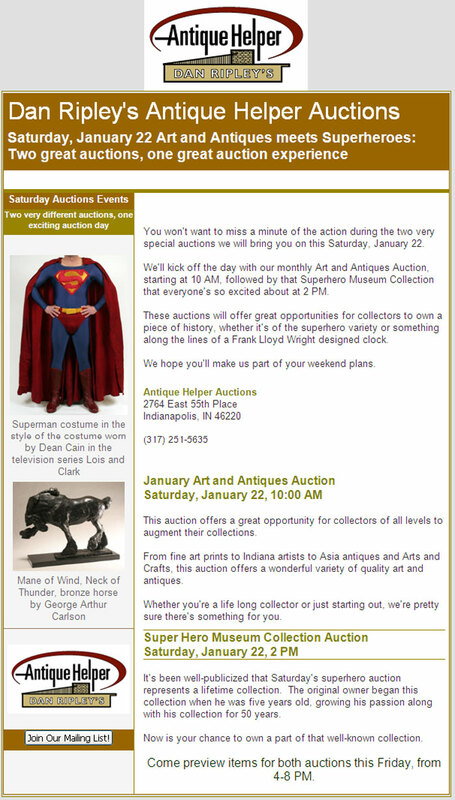 Saturday, Jan 22nd Art and Antiques meets Superheroes: Two Great Auctions, One Great Auction Experience!